Celebrate the spot where you said "I do" with this personalized skyline print. 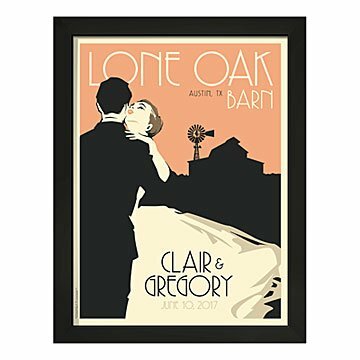 Whether it was a charming barn or a modern museum, celebrate the spot where you said "I do" with this wedding print personalized with your custom skyline. Chicago-based artist Alexander Doll uses archival paper and ink to cast you as a classic couple against the beloved backdrop of your wedding location. The print's nostalgic style takes its inspiration from vintage nuptial announcements with its sharp typography and timeless lines. Alexander incorporates your names, venue name, and wedding date into his design to give each print a warm, personal touch. Printed in Ohio. i chose the smaller frame in case the groom did not want to hang such a big painting on the wall.. I couldn't be happier with this purchase! My husband and I were married two years ago. Second marriage for both of us, and my bedroom walls were still empty! I had never really bought nice pieces of art before, just picked up things from retail stores. In two years I still couldn't decide what to put on my bedroom walls. I wanted it to be special and unique, not just a piece of mass produced art. One day, instead of automatically deleting the email from my inbox, I started browsing the products. When I came across this I got really excited and called my husband in to look at it. I knew immediately it was what I wanted. I gathered my images to send in and placed my order within 24 hours! I'm very happy with it and wouldn't change a thing. Everyone that I've shown it to loves it! Great design, loved the personalization. Not something found in just any shop or website. Perfect for someone who you don't really know what to get them.